Click Yes only if you are at least 18 years of age or older . Celebrating its extraordinary journey and its recovery by our Master Distiller, Ian MacMillan, is its label. Specially created by renowned Scots illustrator Iain McIntosh it retraces the story; from the water source at Margadale Spring to Bunnahabhain Distillery, from the ledgers to the turney casks - the illustration recounts the timeless passion and dedication which has gone into this truly exceptional whisky. 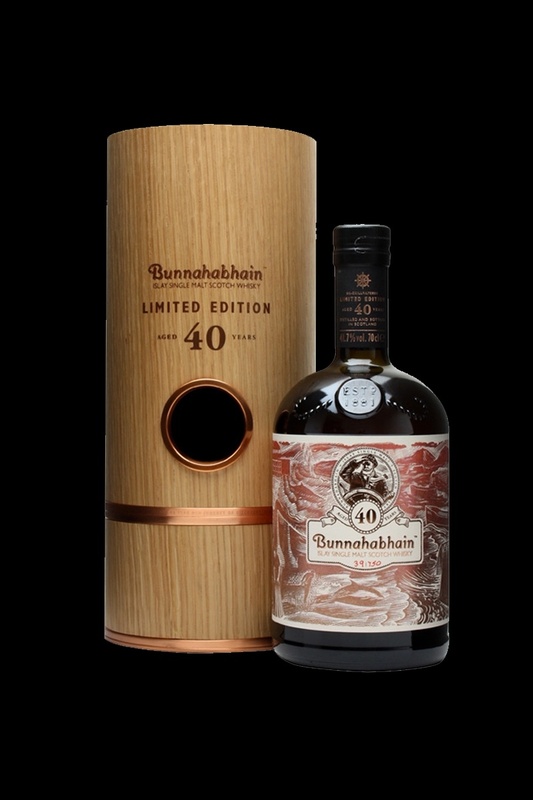 Bunnahabhain 40 Year Old is a one-off release of 750 individually-numbered and hand-signed bottles presented in bespoke packaging. This copper gold dram invites you into its tale with fragrant notes of sweet oak, hazelnuts, citrus peel and chocolate with hints of light smokiness. There it releases a taste with a rich and complex balance of heather honey, ginger chocolate and sweet fruits, finished with a teasingly long lightly spicy nutty note and a hint of sea salt. 41.7% vol. Unchill-filtered.